That was the first thing what I tried. I have the general problem that mentioned earlier, but after hours of reading forum threads I cant find the solution, pls. help me. Some days ago Rome 2 started to crash by each an every launch (after the launcher opened, I click on the "Play" button, and then come the black screen for a second and I'm dropping back to the Desktop -and a crash report .txt appears in the Rome 2 directory) - I have to mention, that once time, somehow started to work but only for one time, I dont know how it happaned but I hope that it means not impossible to work again). (OS is Windows 10 64bit, and the hardware requirements of course enough). I'm really sorrowful, because I've never had this kind of problem since the game announced. Thank you for your attention, have a nice day to all! Hi, please give me your detailed hardware's list (ofc enough isn't a detailed answer) and I'll see what I can do. 1) Win 10 automatically messes with your drivers if you haven't disabled the auto driver updates. 2) Your antivirus is acting weird. 3) Try using STEAM's exe (NOT THE GAME) with Admin or Compatibility rights. 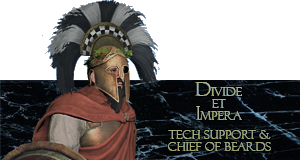 4) Try running the game on DirectX9 instead of DirecXt11 by going to your Preferences.script.txt in C: User/your name/The Creative Assembly/Rome2/Scripts/preferences and then find the entry gfx_device_type 1; and change it to gfx_device_type 0; save it and launch the game. First of all thank You to the answers! - Windows 10, 64-bit (I don't remember the original build number - I think this version is from year 2017), but the first thing what I managed after a fresh Windows 10 installation is to DISABLE the auto updates (through special cmd commands, in order to prevent any further updates and compatibility problems), I use this method by different windows 10 versions and I had no problem till now). I have to note: the game was able to run on this config, without problems (the first problem came maybe after a MANUAL nVidia driver update). Sorry, but I cant understand it, what do you mean by that? (I tried to start it both Rome2.exe and via Steam but in both case the total war launcher will open), compatibility and administrator mode also were tested (and not worked). And where can I get a preference file? I'm afraid I don't have such .txt (I think these file generated after the first - SUCCESSFUL - launch of the game), and I have a fresh installation (actually). I'd try this solution, maybe, this will be a new one, but to say the truth, I don't believe it... (of course I'll try it when I get home afternoon). I'm really curious the source,- and the solution of this problem. Before last week, and at this weekend I sent some e-mails to the CA group about this issue (to every shown adresses), but already no answers. I hope they will bring a solution. Have a nice day guys, thanks to All! - this one worked Me! Thank You! Last edited by ♔Greek Strategos♔; Today at 05:04 AM. Reason: Merged posts. This one worked Me! Thank You! Last edited by ♔Greek Strategos♔; Today at 05:08 AM. Reason: Merged posts.